Are you looking for comfort at the best price? Our hotel is the perfect location for your business and leisure travels with direct access to the Dubai World Trade Center. Enjoy live music at Cubano Lito or indulge in Asian flavors at Wok & Co.
Dubai One Central welcomes you in the heart of Dubai's financial and commercial districts for both business trips and leisure. Our fine hotel offers an easy access to Dubai International Convention and Exhibition Centre and is close to the very central World Trade Centre metro station. Chill out at the gym after a beautiful day and get a good night sleep in one of our sweet beds by ibis while staying connected with the free WiFi in our 588 modern guest rooms. Stop worrying and relax, parking is available, you can also take our complimentary shuttle to malls & beaches. Enjoy shopping in the famous Dubai Mall a few minutes away from the hotel. If you are fascinated by both ancient and modern attractions, Dubai is the place to be. Visit the oldest building of the city, Al Fahidi Fort and discover the Dubai ancestral traditions, schuss down Dubai famous indoor ski slopes at Ski Dubai Mall of the Emirates and finally go on an organised desert safari. 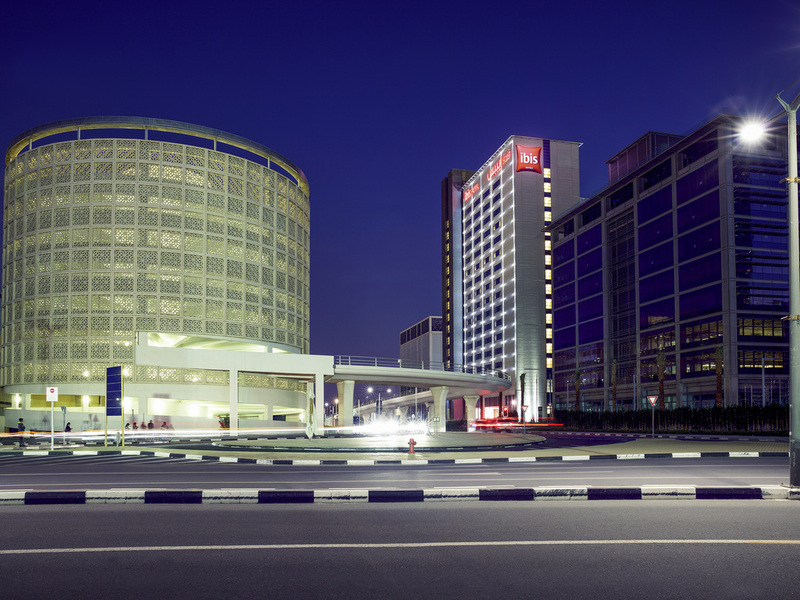 The hotel is conveniently located on the doorstep of Dubai International Convention and Exhibition Centre, the largest conference facility in the region, and within walking distance from Dubai International Financial Centre. Equipped with the new Sweet Bed by ibis bedding, our room offers everything you need for a comfortable stay: large double bed, desk, free WiFi, flat screen TV and stylish bathroom with shower. Interconnecting rooms are available. Equipped with the new Sweet Bed by ibis bedding, our room offers everything you need for a comfortable stay: two single beds, desk, free WiFi, flat screen TV and stylish bathroom with shower. Interconnecting rooms are available. Mix and fix. Cuisine without borders in a trendy setting. Select the ingredients to create your own menu - everything is cooked in a wok as you watch. The Cuban themed Bar allows all guests to get a Latin fix, be it from the authentic light snacks and drinks or spicy live music. Was able to check in easily, and have a decent room, with very good internet connection. Checkout was smooth and easy. Well connected, beside the conference. Good breakfast. I really enjoyed my stay at Ibis One Central. It was my first time at this hotel and I really loved it. It was provided early check-in and late checkout which really helped me with my flight timings. Lack of amenities . Completely say no by the housekeeping . Good economical hotel. Snacks prices is extremely expensive. Coke price is 25 AED!!!! No caffee or entertainment in hotel lobby. The room was very clean and good housekeeping during the days. Breakfast very good, a lot of choices. Although, I do the check in on line, the key wasn’t ready and the room that I booked it isn’t ready and I waited around 10 minutes. I arrived in the hotel after 10:00 PM. Satisfactory, but room was a bit spartan. Breakfast buffet was good and proximity to WTC was a real plus point. However, the room could use a few more amenities like slippers, toiletries, and additional pillows. Don't stay in a Accors Hotel . My experience could be better if Ibis One Central did not provide incorrect information on the Accors website. I chose this hotel for being close to the airport and also because in the selection of Accor hotels in Dubai it appeared that this hotel had transportation between the Airport and the hotel. It appeared to be a free shuttle as it exists in Singapore and other countries. Having done that, I chose the Ibis One Central because in my selection what I needed most was the transport between the airport and the hotel, I arrived in tired Dubai after a 15 hour flight, I went to the place where hotel buses are looking for passengers, which I already used 4 times and waited for 30 minutes, noticing the long delay of the bus I decided to call the hotel and to my surprise what was announced on the Accors website was not real, there is no transportation from the airport to the hotel. Another problem is Accors Gold customer, but it seems that the attendants of Dubai do not care to follow the benefits of the program, I went to the queue that indicated that I had the program and nothing happened the attendants saw me standing there waiting and did not care, I stayed 5 minutes and nobody came to answer me, I was only answered when I got the normal line. What is the advantage of being loyal to a hotel chain, if when you enjoy the benefit of being faithful, the officials are little caring for you. Honestly it is the second time that I have problem with Accors, I will choose my hotels according to my total convenience and I will forget this network that does not care about its guests, that publishes wrong things in its website, that does not train its employees. The experience was good overall The only thing is that the receptionist refuse to give me water upon check out !!!!! We had a very pleasent and professional check in with Milad. Our stay was very good and the staff helped us several times. It was a pleasure staying in this hotel. Almost certainly central place with access to metro for sightseeing. Generally good. Clean rooms and environment. Not noisy. Room a bit tight though. I asked for assiszance with luggage from room to reception but no one came to help even though I was told help was on the way. We made a stopover in Dubai and spend 4 days of our honeymoon at the ibis. We had an excellent time. Nice rooms and good breakfast. Lovely stuff. Thank you very much. This hotel is very well located less than 5 minutes walk from the red metro line, you can easily reach the airport (within like 25) minutes and the Dubai Mall as well (15 minutes). The hotel seems to be very new, and guest areas are much more modern than ibis hotels usally looks like in europe. We had a very pleasant check in with Milad who did his job very professional. The breakfast is rich and varied. Thank you! overall it was good except during check In. I Bring may wife with me and the reception man informed me that will additional charge for each person will stay in the room as per Hotel Policy. asked me to paid additional 63 Dirham for each night. I paid it in cash then he informed me this it will cover breakfast for my wife as well. when I double check with my friend they stayed at different hotel booked by company. they didn't pay anything extra for them wife. letter I discover the cost of breakfast with VAT it is exactly the amount I paid. I am fine if it is as per Hotel Policy for staying, but I believe that reception man twisted to be as rules for Hotel but actual it was for breakfast. I need to confirm from Hotel if them policy for any additional person we have to pay more or not. dedication to meet customer satisfaction , even though it's a 3 star hotel but actually treatment is 5 stars . at reception they were very helpful during the stay and was so flexible in the check-in and check-out timing - well appreciated the customer service especially Alaa, Majd and Hatem .. The stay was quite good. Few things were a bit annoying. The power socket was an American type. I arrived at 1:30 am and called reception if they could loan me a travel adapter. They had none and asked me to check the shop close to reception in the morning. I had enough juice in the cell and laptop batteries till morning. I bought it eventually. It would be nice, however, if you would provide a travel adapter to use it with the round pin plug. The adapter is quite cheap too. Secondly, the TV service was horrible. It would turn off every 40/50 minutes and then be on after 10/15 minutes or so as I experienced during the three nights I was there. and finally there was no toiletry provided other than the hand/body wash liquid. Otherwise, the location was great , close to Dubai Metro. Room service was excellent too. Good, two points for improvement: 1. The in room TV has a connection for HDMI, but the HDMI cannot be activated on the TV 2. The welcome drink voucher cannot be used for draft beers in the bar. I could not find any infromtion of what is covered by the voucher.